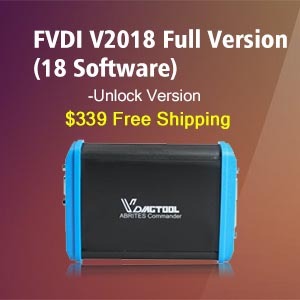 This post show guide on how to use TMPro2 key programmer to program keys,include add spare keys and all key lost programming. Working with TMPro 2 is easy. You must have some electronic knowledges and equipment, like soldering iron, hot air gun, multimeter etc. Also you need to know which unit contains key data, and it`s location in vehicle. 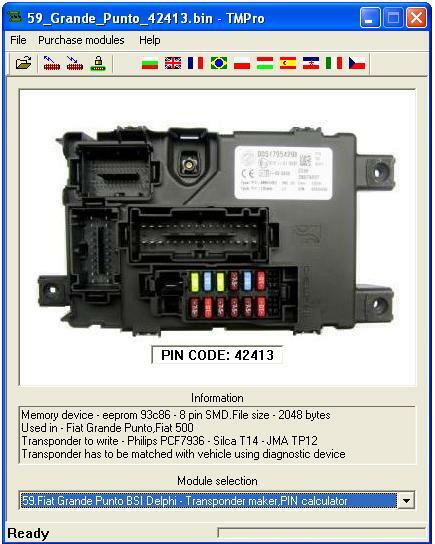 Remove unit from vehicle, open it and locate memory device. 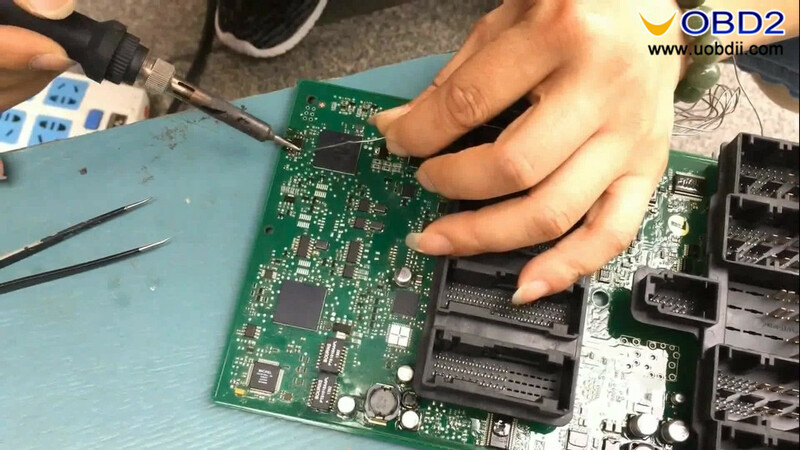 For some of units memory device is easy to be accessed, but for other it is not easy – you must cut a hole, dig a silicone etc. After all connections are done, you have to press on Select and read memory device button, select correct memory device and press OK to process with reading. After reading is done if you wish you can save file read for your archive. In case for to read and write memory devices you use other programmer, then after memory device is read and file is saved by your programmer you have to load this file in TMPro by clicking on Open file button. 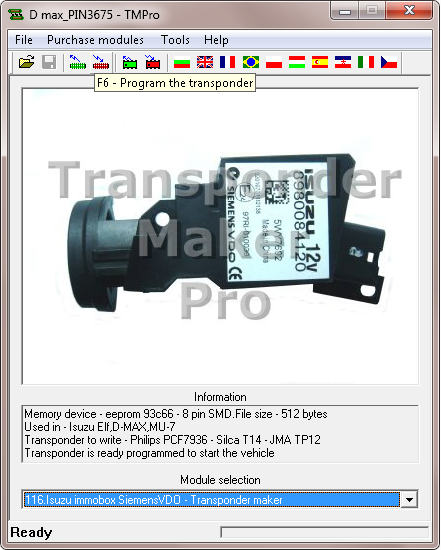 – If this software is already activated in your TMPro box, button Program the transponder will become active. In left down corner you will see message Ready. If software can calculate PIN code, you will see PIN code displayed onto software picture. 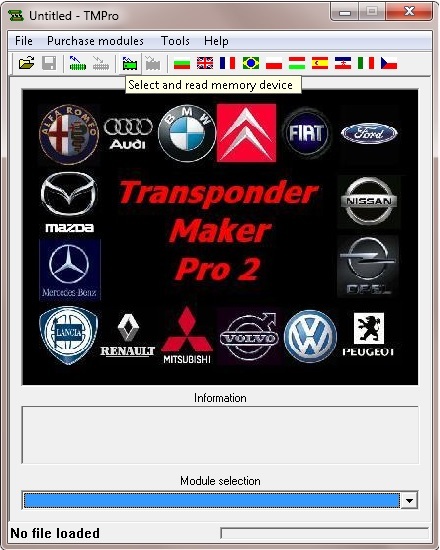 – If this software is not activated in your TMPro box, button Program the transponder will remain inactive. In left down corner you will see message Module Not active. 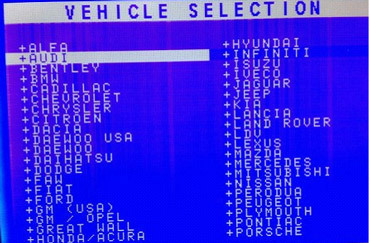 In MODULE SELECTION combobox below picture of vehicle unit you can see number of specific software and it`s name. On TMPro screen you will see picture of vehicle unit that software associates with loaded file. 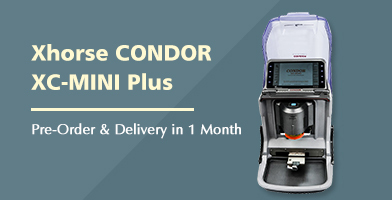 If this unit is same as unit, from which was read memory device, this means that file read is correct and particular specific software is OK to produce working transponder. If particular specific software is not active in your TMPro box and you decide to activate it. IMPORTANT NOTE:Automatic recognition of files works independently of that if particular specific software is activated in your box or not. This way you can test your file if is OK for software that you think has to be correct for it. 2-If data read from memory device or file loaded is not recognized by any of specific software modules, TMPro will show startup screen and in left down corner you will see message Please check file. Insert in antenna needed transponder and press Program the transponder button. 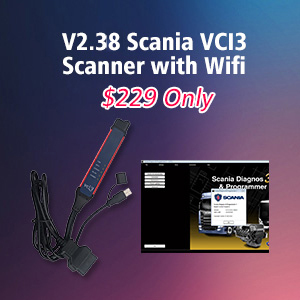 – With softwares,that require T5, PCF7935, TPX1, CN1, TPX2, CN2 or CN5 TMPro will program transponder. You can program as many as you wish transponders. After that you can assemble unit and fit it back in vehicle, then start it with new key(s). Job is done. – With softwares,that require HITAG2 or Megamos Crypto you will see menu where you must select between ALL KEYS LOST or MAKE SPARE KEY jobs. If there are no valid keys, select No (all keys lost) . 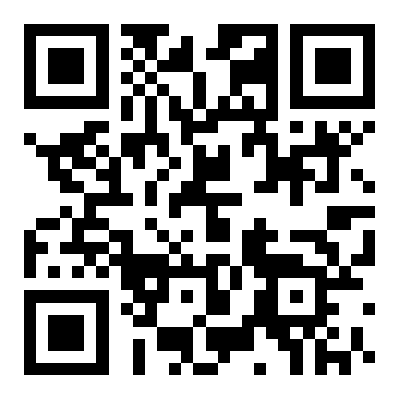 TMPro will generate new file for memory device and then will program transponder. If there are no valid keys and you want to make 2 keys, at first select No (all keys lost) and program first key. Leave this key in antenna. Press Program the transponder button again, but this time select Yes (spare key). If there is a valid key and you want to make spare key, at first insert working key into antenna, then select Yes (spare key). TMPro will check if this key belongs to file loaded into software. If key belongs to file then you will get message to remove original key and place key with blank transponer. Press OK and software will generate new file for memory device and then will program transponder. If memory device was read by TMPro2 Maker, software will write new file in memory device automatically. You can assemble unit and fit it back in vehicle, then start it with new key. Job is done. If memory device was read by other programmer, you must program memory device with new file, that software has generated. New file is located in same folder, where is original file, and has an _TMPro extension added to original name. Some softwares does not use data read from memory device. These softwares are transponder image generators softwares 39, 102, 103, 146, 152 and 157. To work with these softwares you must make manual selection of desired software using manual selection combobox below modules picture. 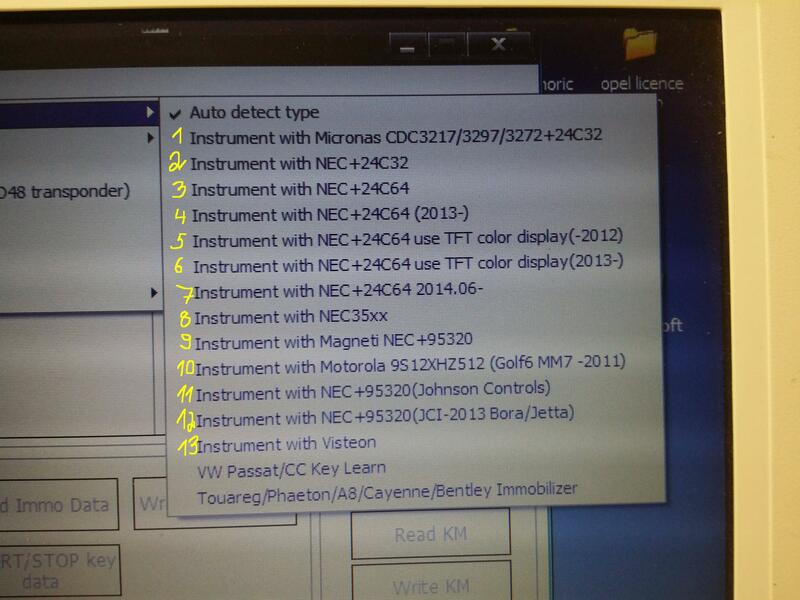 Yamaha Moric type2 software 108 also requires manual selection.